The Orangeville Food Bank will be hosting its first Coldest Night of the Year (CNOY) walks this Saturday, Feb. 24, to raise money for the building’s rent. CNOY is a “super-fun, family-friendly fundraiser that raises money and awareness for local charities serving hungry, homeless and hurting families and youth” in over 125 communities in Canada. There are two-, five- and 10-kilometre walks, with different routes around Orangeville based on the choice of walk. The fundraising event goes from 4:00 p.m. to 8:00 p.m. at Princess Elizabeth Public School, and afterward the walkers will meet back at the school, where light refreshments, chili and treats will be provided. The registration fee is $40, but for children 10 and under it’s free. Youth from 11 to 17 need to raise a minimum of $75, adults 18 and over need to raise a minimum of $150. 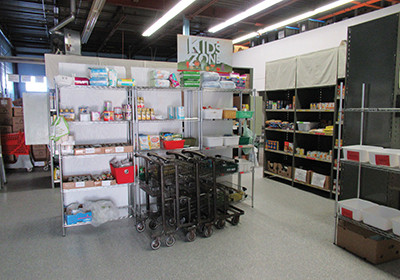 The food bank currently supports 500 people a month, 38 per cent of them being children, while seniors are the fastest-growing demographic. To register for the event or join a team, visit www.cnoy.org/orangeville.